Form: Consists of three dimensional network of anastomosing thin walled tubes, which form a compact, low-lying anastomosing mass attached directly to the substrate. There are no erect free branches. Colour: Usually white, but can be grey, pale rose, orange or sulphur yellow. Surface: Of tubes, smooth and soft. Apertures: Several tubes join to share one common oscule, slightly raised above the surface, "but never marked tubular". Spicules: Spicules are triradiates only (60-120μm long x 6-12μm wide) (cf. L. botryoides which usually has oxea and quadriradiates in addition), with rays which meet at equal angles. Habitat: Found on clean rock surfaces, also under overhangs and boulders on the shore. Primarily a shallow water species. Often found associated with Dendrodoa, in surge gullies etc. but also found in sheltered situations (caves, overhangs). Further research may reveal this to be a complex of species. Distribution: In the east Atlantic it is reported from "the Arctic to S. Africa, littoral to 650m." 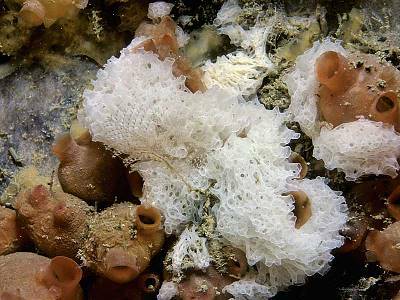 This is likely to be an error as most so-called cosmopolitan species of sponges are now known to be groups of several distinct species. A common species in the British Isles on all coasts. Identity: Several new species have recently been described from the NE Atlantic and it is likely that different forms currently identified as Clathrina coriacea are in fact distinct species. 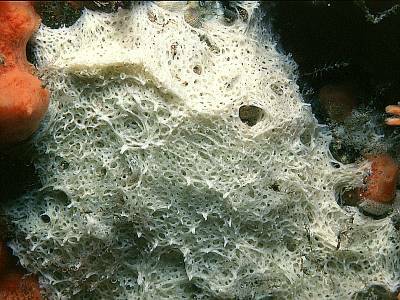 Once the sponge is well known, it can usually be identified by sight, but beware L. botryoides (q.v.) which also consists of thin-walled tubes. If the specimen is intermediate between the two species, a microscopic section needs to be examined to ensure only triradiates are present. 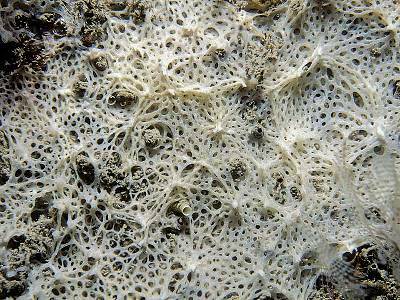 Some bryozoa have a superficially similar form but are hard. 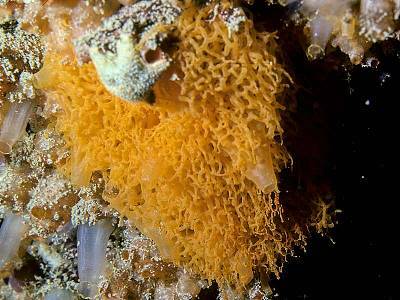 One species of colonial tunicate at a superficial glance looks a little like C. coriacea but on closer inspection can be seen not to consist of tubes. Voucher: BELUM : Mc5. Strangford Lough, Down.